So. I'm gonna have to be 'that guy' and highly disagree with the Hamilton tornado rating. To get a 130mph EF2 from the house with only a single small interior room standing, poorly built or not, requires turning the EF scale DI slider to literally the very bottom end, which WFOs are seemingly defaulting to now. BMX rated a home with similar degree of exterior walls standing (albeit with much stronger contextual evidence and brick construction) EF4 at Beauregard. NWS Jackson has really ramped up the conservatism with their surveys in recent years. The Columbus tornado from earlier this year was rated “137 MPH EF3”. What is the deal with that? Damage was solid EF3, but the wind speed estimate seems to suggest that they were very hesitant to rate it as such. Can they take radar data into account when rating these things? They can, but their current official stance is that it can't be used to modify ratings; see the El Reno 295mph EF3 fiasco. Hopefully that changes or at LEAST they add a footnote to survey and Storm Data that the tornado is likely underrated. They have used mobile radar to rate a few others before El Reno though so even that standard is inconsistent. The extreme conservatism is actually how the scale is supposed to be applied based on training textbooks/documents according to professors and NWS meteorologists I've spoken to. WFOs are, techincally, by the book, SUPPOSED to default to the lowest possible rating on DIs. Not that I agree with this policy, but it's supposed to be a STRICT scale which only considers known DIs and defaults to the absolute lowest possible rating with said DIs, and not take any sort of radar or contextual evidence into consideration. I disagree with this method of rating but by all accounts, MEG applied the scale perfectly according to the book. I think the trend of conservative ratings is just kind of a natural bias. A conservative estimate that you can definitively support looks like a measured, scientific decision. A higher rating that could be disputed looks reckless. The fact that we can’t directly measure tornadic winds to definitively correlate them to DoD means there’s always some speculation, so I think the surveyors’ instinct is to limit additional uncertainty. I don’t know if you’d call it La Plata syndrome or whatever, I think it’s just a product of the way public-facing science works. I'm totally fine with conservatism if its applied consistently throughout WFOs, by my main issue is that due to the increasing stringency, most F2+ ratings prior to ~2000 are way too high, and the same house that would've had an F4 slapped on it is now closely scrutinized and given high EF2; more accurate maybe, but creating a further massive gap in historical consistency. Until there's a project to revisit and lower the massive number of historically overrated tornadoes, the huge inconsistency in data is going to severely irk me. And I'm of the opinion that the standards are a bit too high and wind estimates are perhaps less accurate than on the original F-scale now that we've had wind measurements in several plains tornadoes in recent years. I'd like to see the basic standard for rating be a typical house and not a massively overbuilt one. Missing three or four washers on anchor bolts on an otherwise well built home shouldn't be the a reason to massively downgrade a rating. Yes it's definitely valid from an engineering standpoint but we are really overcomplicating a simple six point scale. But then again, it varies from WFO to WFO. The Franklin, TX tornado produced pretty much the same degree of damage to homes as the Hamilton, MS tornado, yet was rated EF3. And as mentioned earlier, BMX was a bit liberal by today’s standards with the Beauregard tornado. I suspect that it would have been left at high-end EF3 in the NWS Jackson or Memphis WFOs. Yeah my point exactly. As long as basically the entire enthusiast community can say something like "well that couplet is moving into LZK/FFC/etc, there goes the rating by 1-2 levels" then there's a serious consistency issue. For what it's worth, Alto rated high-end EF3 (160mph) and the surprisingly strong Shelby, OH tornado from yesterday at EF2. Some rather strong tornadoes from the event, but I still think the radar-monster tors near GWX had higher potential had they hit substantial things. I absolutely agree on the historical context. I've run into a fair number of people who think there is a downwards trend in strong/violent tornado numbers, when there's no real evidence that this is the case - just an upwards trend in the strictness of rating standards. 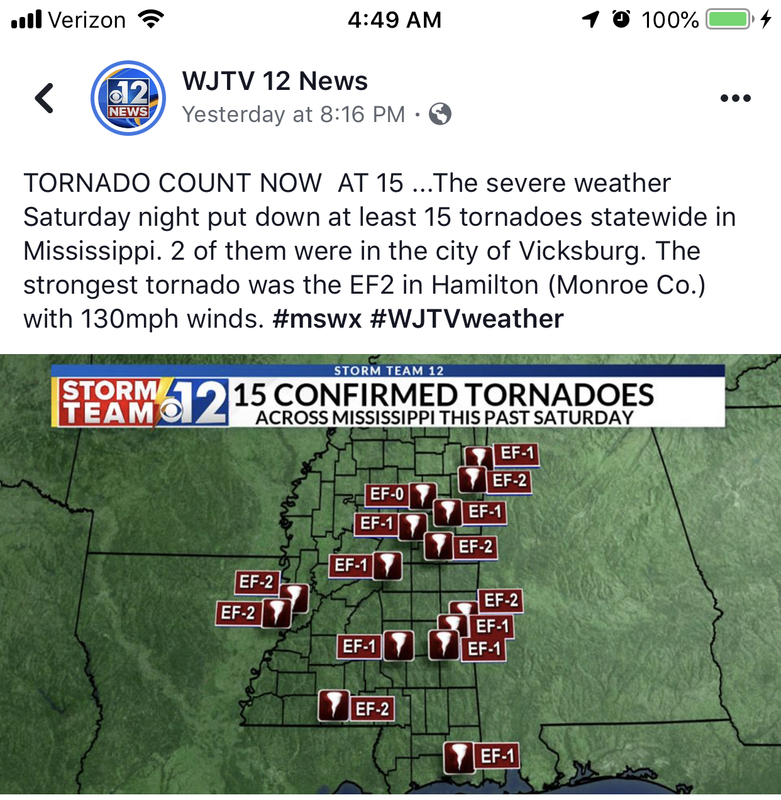 The classic example of this being the misconception that 4/3/74 was much more violent than 4/27/11 (I took a look at the 1974 Super Outbreak and the 1965 Palm Sunday Outbreak under the lens of more modern rating standards, and they both seem to have produced around the same number of violent tornadoes as the 2011 Super Outbreak - more on this in the super outbreak thread). Crazy night for my state!